My favorite strategy to minimize distractions is to turn off all unnecessary notifications that tend to disrupt concentration. I call these little productivity demons chimes, dings, and rings. They may seem harmless but according to a survey performed by Career Builder, 24% of workers admit to spending at least one hour each day on personal calls, emails, or texts. If you’re unaware your phone just received a text, you won’t feel the need to respond it. You also won’t be zapped out of the zone you had been working so diligently in before that pesky notification alerted you. Take inventory of all the audible distractions you deal with on a daily basis that are within your control. Identify which notifications are indeed legitimate. I purposefully schedule meeting reminders within Outlook. I want those reminders to break me out of my zone so I can switch hats and focus my attention on reviewing notes and adequately preparing for the meeting. Otherwise, I might miss it or show up unprepared! I don’t have an internal clock that alerts me when its 15 minutes to one o’clock so I choose to keep meeting reminders turned on. Numerous other notifications, however, cause more harm than good. No matter if they come from your phone, computer, tablet, or other device, if there would be no ramifications from turning these alerts off, turn them off! If you can’t hear them, they can’t dictate how you spend your day. If you don’t know how to turn certain notifications off, simply YouTube it! Employers recognize cell phone calls and texting (50%) and social media (38%) as primary productivity stoppers according to the same CareerBuilder survey. It doesn’t matter if you’re an employee, entrepreneur, or business owner. The result is always the same: succumbing to small distractions adds up to giant gaps in productivity. If you respond to chimes, dings, and rings you hear, or even just lose a bit of focus any time a notification sounds, you are forced to be reactive to your environment. As a result, you are at the mercy of everyone else’s wants and needs. Instead, proactively respond to the people on the other end of those notifications on scheduled intervals, at times you choose. 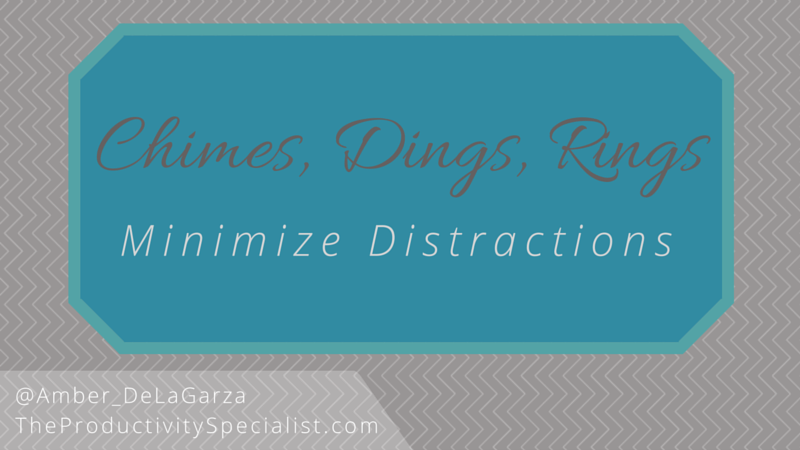 Choose to be productive by choosing to minimize distractions! Commit to turning off all unnecessary notifications that distract you throughout the day.